[Ελλάδα] «Μπουτίκ δώρων "Κατερίνα"» Βάγια-Βοιωτίας. Tηλ. 2262-0-61161. [USA] «ΕΛΛΗΝΙΚΟ», (Mediteranean Gourmet), 490 Main St., Fort Lee, New Jersey. Tel. (201) 947-0075. The motivation behind this work is to pay respect to and appreciate the contributions of the Hellenic pioneers in America who paved the way for future generations of Hellenes (Greek Americans) in the United States. 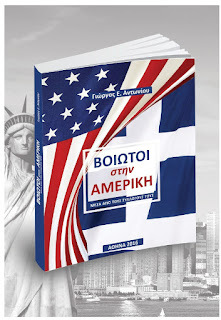 This book chronicles a portion of Hellenic immigration to America. The historical facts presented are based mainly on sources such as newspapers, government records, archives of cultural societies, as well as testimonials. The collection of photographs and prints, documenting people and their activities, are genuine. The Hellenic voyage across the Atlantic began with the adventures of sailor «christiano griego llamado Dorotheo Theodoro» who arrived in Florida during the 15th century. He is considered the first Hellene who came to America as a crewmember of a Spanish expedition. Centuries later, in 1828, an orphan of a Greek captain who was killed at the Hellenic Revolution, named Lucas,was adopted by the American philhellene J.P.Miller. Years later Lucas Miltiades Miller pursued a lawdegree andwas elected in the US House of Representatives (Wisconsin, 1891). Lucas is considered the first known Boeotian, from Livadeia, in America. During the Hellenic immigration wave of the early twentieth century, a couple hundred thousand Greeks arrived to United States through Ellis Island. Immigrants from Boeotia primarily settled in New York, New Jersey, Michigan, Indiana, Illinois, and Washington. In 1912 immigrants from Distomo established the first Boeotian society named: «Patriotic Society Distomiton», in Chicago, Illinois. Two years later another Boeotian society was created in New York City named: «Pamboeotian Association Kadmos». 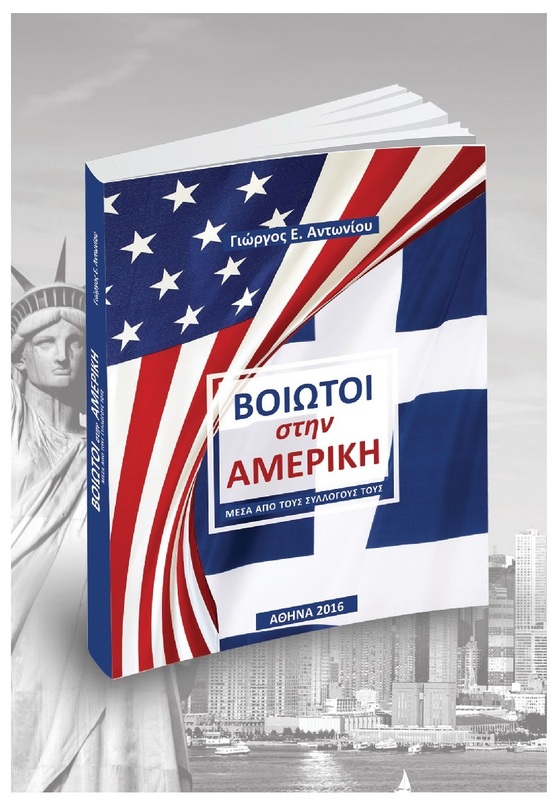 In the second decade of twentieth century, Yiannis A. Kyriakatis and Antonis X. Sakellariou came to NewYork. They both excelled as clarinetists inNewYork and later in Hellas. Their performances, especially in traditional Greek songs and Rembetika, are considered of unique value even today, with a number of their songs available on YouTube.Within this period, Dimitrios M. Kratis-Kollias from Domvrena Boeotia, aworld renowned painter, came to NewYork (1912). Kratiswas the founding secretary of the «Pamboeotian Association Kadmos». Towards the early 1920s a Distomitan Archimandrite, Father Daniel Gambrilis, immigrated to Chicago where he played a vital role in the formation of four Greek Orthodox churches. Furthermore, he advocated the creation of the «Federation of Sterea Hellas U.S.A. & Canada» (1945). Later, Father Daniel was honored for his services to Hellenes in Chicago by a Royal order from King Paul of Hellas. During the Hellenic migration of the 1950s,most of our compatriots from Boeotia settled in New York, New Jersey, Pennsylvania, Ohio, Illinois,Michigan and Minnesota. After a few years in America they established cultural societies in New Jersey («Society Thevaion Epameinondas»), Ohio («Society Thivaion Elikon»), Michigan, Ohio, Minnesota, and New Jersey («Panthisvian Society»). In the beginning of the 1960s, immigrants from Boeotia greatly contributed in forming athletic soccer clubs in New Jersey. The first athletic club named «Macedonian Soccer Club» was established in Jersey City, New Jersey (1961), followed by the «Ridgewood Olympics Soccer Club» of Ridgewood, NewJersey (1972), the «Olympic Soccer Club» of Jersey City, New Jersey (1972), the «AEK Jersey City Soccer Club» of Jersey City, New Jersey (1975), and the «New Jersey Olympians» of Fort Lee, New Jersey (1985). In the 1970s two descendants of Boeotian immigrants were elected city mayors. Pete Panayiotis J. Chalos (1927-2006), from Vayia Boeotia, served the city of Terra Haute, Indiana for 16 years, and Dimitrios S. Tasigiannis, from Domvrena Boeotia, served the city of Ecorse Michigan for 12 years. The year 1990, three women (Stacy Dominos, Voula Golematis and Helen Vayia) from Boeotia contributed greatly in forming the «Hellenic Music Society» of Clifton, New Jersey. Rev. George Papaioannou (1933-1999), from Chostia Boeotia, was ordained Greek Orthodox Bishop of New Jersey at the Saint John the Theologian Greek Orthodox Church in Tenafly, New Jersey (1999). The late Bishop of New Jersey Dr. George Papaioannou authored, among other works, «The Odyssey of Hellenism in America». The above only scrapes the surface of this book. Through our people's stories, experiences, and contributions, the book digs deeper into how they promoted, conserved, and perpetuated our rich cultural heritage. In our new cultural milieu the preservation of the Hellenic heritage should be a principal effort for current and future generations to embrace. In the gradual process of assimilation, we must not abandon Hellenism carried across the Atlantic by our forefathers, and cultivated over thousands of years through the writings of Aristotle, Plato, Thucydides, Pindar, Euclid, Aeschylus, and Sophocles, among many others. Their truly unique and pioneering ideals have enlightened people of many cultures across the globe.